If you have a newer MacBook Air you should pay attention. Some of the MacBook Airs are shipping with Samsung displays, and some are shipping with LG displays, both are quality displays, but the LG’s default color profile is lighter and a bit flat. Most users probably won’t notice this, but if you sit a MacBook Air with a Samsung display next to one with the LG display, you can see the difference. This is easily remedied by using a custom color profile that has better gamma. This post will walk you through how to check which manufacturers panel you have, and also show you how to add a custom color profile that makes the LG display just as gorgeous as the Samsung. Using the same command to check the make and model of an LCD that works on past Macs, you can check the manufacturer of the display panel of the MacBook Air. 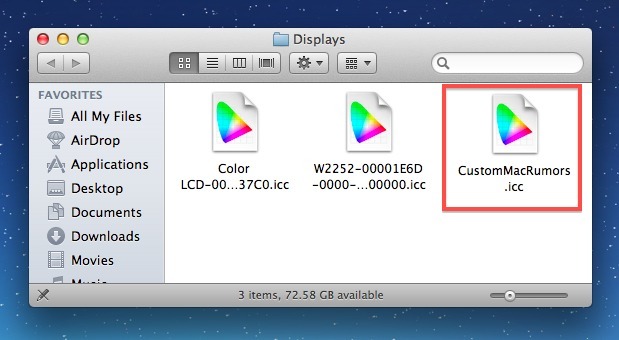 A user on MacRumors forums put together a custom color profile that really sharpens the display of the LG displays in some 2011 MacBook Air machines. Again, if you don’t have an LG display then you shouldn’t use this profile. Adding this color profile is reversible and you can always go back to the default if you don’t like it. If you have the LG display, you’ll see a difference immediately. Contrasts are sharper, whites are whiter, and there is a much more clear differentiation between minor shades of colors and greys. 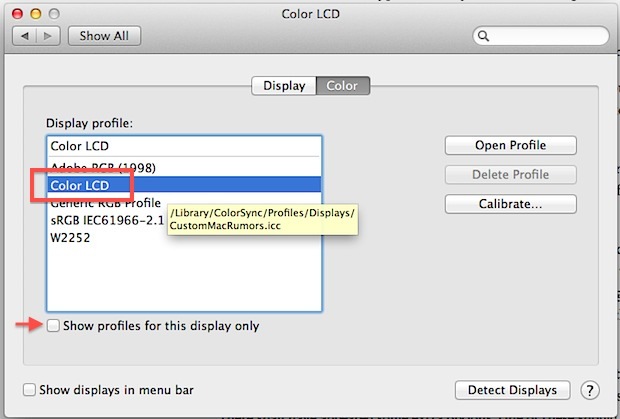 If you decide you don’t like the modified LG profile, just select top-most “Color LCD” in the list. You can also put the color profile into the user home library folder instead of the system library directory, but you’ll probably have to make the folder yourself. Thanks to Erlend for sending in this tip from Mac1.no! It just makes everything more contrast-y but more dark too. After a week of running with the new look got tired of it, reverted to the default color profile and living happily ever since. You should click the “Calibrate” button and make your own profile. And that should be repeated every three months. I have a custom-created profile using an X-Rite i1 Display 2, and it’s almost identical to the one provided in this article. The default profile shipped by Apple is definitely way off. Thanks for this article! This profile is not even close to the one i got from a spyder 3… i’m happy with what i got and wouldn’t recommend this – too much yellow. It would have been better if they did not use “Color LCD” again. Aren’t these profiles tweaked differently for 11 vs 13″ displays? Awesome! This was my biggest complaint since day one. I tried to calibrate myself but ended up clipping blacks in Aperture. Thanks for the help. This worked like a charm. I get as far as opening the display but then I do not know how to copy the download onto displays, when it says to uncheck the box, they are checked on my end so there is nothing to uncheck. If anyone is stuck like me or can help please let me know. much appreciated. I have the Samsung panel and my wife has the LG one. There is no doubt that the Samsung panel is slightly dimmer than the LG’s one. Personally, I feel that LG screen is superior to Samsung. Believe it or not, I find out that reading on the LG screen is easier than on the Samsung. After 3 times of exchanging my MBA, I finally got the one that comes with Samsung’s display and SSD (previous two were LG’s screen). I can’t be happy more. I have to admit that in terms of colour, Samsung’s display is way better than the LG’s one. It is more vivid and striking. The text also appears sharper. YES, you may argue that LG has better colour-accuracy or whatsoever, but you will only say that if you own the LG’s one. I bet if you are given a chance to choose between the LG and Samsung, you will definitely go for the samsung. Don’t deny, that’s the fact. One last important thing, though you can change the display property of LG’s screen via the method posted by this post but it won’t be as perfect as the Samsung’s one, WHY? everything becomes darker. If you have an image where some areas (e.g. corner-side) are darker, by following this method that corner will become even darker and not visible. In other words, the method destroys the quality of pictures. Do NOT follow the trick posted on this page. The .icc profile uploaded here ruined everything. Grey becomes black, black becomes invisible, it just horrible. Ruined? You can switch back to another profile with a single click, “ruined” is a bit dramatic. Maybe next time you should verify that you had an LG display and not just install a profile that isn’t fit for your computers display. I agree, better contrasts but it does seem a bit dark. Are there other presets available? The colors are really more comfortable than before. Thanks for posting this. I’ve noticed that colors were a bit washed out on my LG Macbook Air. I tried my own calibration but I always made my darks brown by lowering the contrast too much. This is perfect. Thanks! LG Displays from television sets and now Mac display components are known for “get the money” . I knew this from staff that reported that all LG cares about is money. Never ever buy an LG product just read the reviews. So you only read reviews but never actually used an LG product. Just checked this on a Mac Air 11″ 2012 model. The return I had was: B116XW05 V6 color LCD. I suspect this method will ruin your display, after long use with this tweak, your display will generate vertical dead pixel. The profile worked great on my Macbook Air Mid Summer 2011. My color profile became corrupt or changed after I applied the Mountain Lion Update over the pre-installed Lion. I tried several times to calibrate manually since that update without success. This fix looks more like I remember the original factory look. Man, the provided profile is really deep and dark. I had to calibrate myself. BTW, Macbook Air mid 2012, LG panel. I recently purchased a Macbook Air and found your tutorial very useful and noticed a huge change when I applied the colour profile to my LG screen. If it helps anyone, I created a native OS X app that should pull the information out for you and determine whether your screen is LG or Samsung. Great app! I noticed it does not run on Macs without the Xcode command line tools installed though, looks like a dependency for the ‘strings’ command. The original command syntax pipes through strings at the end, though it still works without that if you don’t mind some added gibberish. Perhaps strip the excess characters with awk or regex, eliminating the dependency? The contrast on my new macbook air has been driving my eyes crazy. Thanks so much for this post! I bought my missus a MBA for Christmas and every time I used it after using my MBP, I couldn’t believe how bad the display was. I thought it was broken! OMG! Thank you! So much better. One note, the instruction “Hit Command+Shift+G and enter the following path:” works once you have a Finder window open, but won’t if you’re still reading from a web browser. The new display profile looks great to me. Except … it won’t stick. The second I go away from system preferences, it reverts back to the old one. I’ve applied it, and quit – goes back to original display. I’ve even left system preferences open with that checked, but, the second I use anything else – back to the original display. Anyone have any idea why this is happening and can steer me in the right direction so it stays with the new profile? Thanks! The link to download the color profile is no longer working. Do you have the right one? Also wondering if theres an updated download page please? File no longer available but would like..